Every day the average person uses over 10 different personal care products containing hundreds of different toxic chemicals. Many of these chemicals are hormone disruptors that have been linked to infertility, cancer, and birth defects. What if I told you that getting pretty didn’t have to be so toxic? 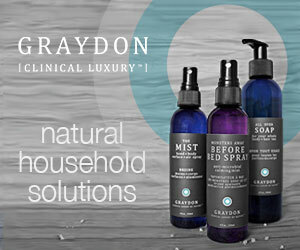 Join me as I combine forces with Graydon Moffat, the natural beauty guru behind Clinical Luxury By Nature to help you navigate the world of eating and shopping for your healthy, non-toxic skin! Learn to make your own natural beauty products with the guidance of Graydon as we talk to you about the importance of choosing products with the right ingredients. In our workshop, you get to become your own ‘kitchen chemist’ learning how to craft your own simple yet highly effective face products—such as a cleanser/scrub, masque, serum and aromatic healing mist from (super)food based ingredients! 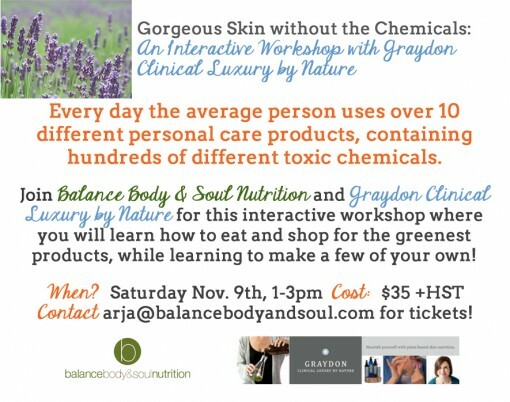 Of course there may still be times when you would prefer to purchase skincare products, and as such Graydon will help you deepen your understanding of organic, green, and sustainable terminology and how these terms relate to product choices. She will also have her beautiful line for sale after the workshop! $35 for early bird tickets valid until October 27th. Tickets are $40 after the deadline - register now! Space is limited and you won’t want to miss out! !